Also known as ArtSat-2; from Tama Art University. 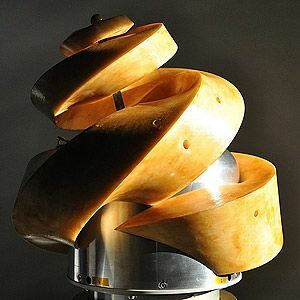 The yellowish, tapered-helix assembly was intended mainly as a work of art although it also carries an amateur radio communications payload with a limited range. In a 0.915 AU x 1.089 AU x 6.8 deg solar orbit. Art, amateur communications satellite for ARTSAT project, Tama Art University, Japan. Launched 2014. Status: Operational 2014. First Launch: 2014-12-03. Last Launch: 2014-12-03. Number: 1 . Gross mass: 32 kg (70 lb). Family: Technology. Country: Japan. Launch Vehicles: H-IIA 202. Launch Sites: Tanegashima Y.
DESPATCH - . Mass: 32 kg (70 lb). Nation: Japan. Class: Technology. Type: Art satellite. Spacecraft: DESPATCH. USAF Sat Cat: 40321 . COSPAR: 2014-076C. Apogee: -50,912 km (-50,912 mi). Perigee: 245 km (152 mi). Inclination: 29.90 deg. Also known as ArtSat-2; from Tama Art University. The yellowish, tapered-helix assembly was intended mainly as a work of art although it also carries an amateur radio communications payload with a limited range. In a 0.915 AU x 1.089 AU x 6.8 deg solar orbit.